Tricky questions ranging from Gridlock to Gran Torino. The Picture Round is Famous Beards and the Wild Card is a power watching puzzle about the Walking Dead. Q09. Gridlock, Popcorn and High Society are all books written by which comedian? Q20. On which 1979 Clash album would you find the track Lost In The Supermarket? Q27. Which football Manager took Southampton to the FA Cup Final in 2003? Q38. Who directed (and starred in) the 2008 movie Gran Torino? 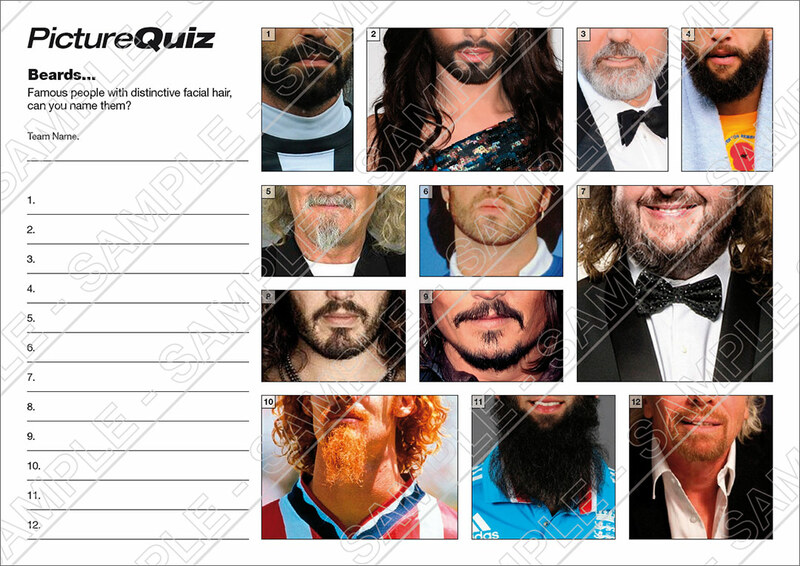 Here’s a low-res sample of Quiz 033s Famous Beards Picture Round, click for a higher resolution version. The Picture Round download is a two page high quality PDF with the answers on page 2. Quiz 033s Picture Round is can you recognise these well known people sporting the famous beards. The Wild Card for Quiz 033 is a power watching puzzle about the AMC series The Walking Dead.